Ursula not only provides administrative support to both the department chair and the department administrator, she also coordinates the complex process of vetting candidates for faculty positions. 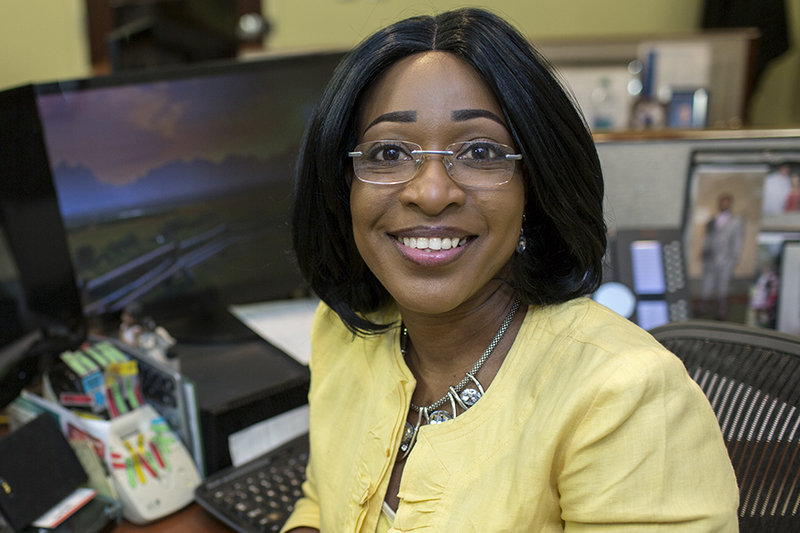 Looking at Ursula Jean-Baptiste, you’d never know she got to Radiology by digging a hole. The polished and ultra-professional senior assistant to the Department of Radiology and Imaging Sciences’ top brass was repairing a plumbing line on a private residence which happened to be the home of the then-director of Human Resources. It’s no easy feat. A candidate for a position like vice chair for quality, one of more than a dozen faculty searches Ursula currently manages, has to meet with 20-30 different people over a two-day period. Ursula has to secure the meeting times on every participant’s schedule, taking care not to let meetings interfere with Radiology faculty members’ clinical care responsibilities and their own travel schedules. She also has to consider proximity between meeting locations so candidates aren’t spending most of their time commuting from one location to another. Ursula arranges for transportation—air and ground—as well as lodging, and venues for dinners and lunches. If the candidate is brought back for a second visit, the arrangements get more complicated: candidates are paired with real estate agents and other friends of the department to help them get to know metro Atlanta and see where and how they might like to live. It’s a lot when you consider the department vetted nine candidates in November alone. A deep desire to provide outstanding customer service also helps. It comes from the heart. . . and from exceptional customer service training she received years ago working at Home Depot. “It’s the little things that make a big difference in a person’s day, in their life,” she says, passion punctuating her sentences. She then shares how a gentleman once called her, his voice quivering as he explained he was looking for a saint pendant on a chain. He had lost it and the last place he’d been was imaging at Winship Cancer Institute at Emory. Connecting with the man’s distress, Ursula did not call over to Winship to ask if anyone had seen the pendant. She went herself to look for it. “And do you know I actually found it?” she says, still incredulous. After calling the man to share the good news and to get his mailing address, she bought an Emory card to send with the pendant. “I could tell this means a great deal to you,” she wrote before sealing the envelope and sending the pendant on its way home. A few weeks later she received a card from the gentleman thanking her and telling her how much it meant to him. She pulls the card out of her desk as she tells the story, her own voice quivering. “He wrote to tell me his wife had given him that pendant, which was of St. Benedict, and he was so upset thinking he might have lost it. It meant so much to get it back he sent me a $20 gift card to Starbucks as thanks. He was so nice!” She says, downplaying her own kindness. Ursula herself is incredibly nice, and that niceness spills across her desk when she greets you in the executive suite, soaks into your ear when she answers your phone call, even when you’re the 25th caller or visitor of the day. “Kindness is essential to excellent customer service,” she says. True, but how does she manage to sound so upbeat on the twenty-fifth call of the day? Sound advice from someone who reflects the highest standards of customer service.